After a superb few days in and around Darwin it was time for us all to go our separate ways. Nadia's parents left the apartment early to embark on their own outback adventure with a whistle-stop tour of all the main tourist sites whilst Brian, Caroline and little Erin were flying out to Sydney for a while before heading back home to Alabama. One of the displays at the 'Window on the Wetlands' centre. We were hoping to see ALL of the above over the next week. Following a few emotional goodbyes we headed out of the city and east along the Arnhem Highway for the three hour journey to Kakadu National Park. To break up the car ride, our first stop off was at the 'Window on the Wetlands' visitor centre perched upon Beatrice Hill. This imposing, contemporary lookout over the Adelaide River floodplain provided us with a handsome adult Brown Goshawk circling just overhead as well as a female Leaden Flycatcher and a small family group of White-throated Honeyeater. We then continued onto Aurora Kakadu Resort for another brief stop to collect our permits. It was here that we connected with a large, noisy flock of Little Corella feeding along the roadside along with the odd Galah and Sulphur-crested Cockatoo. We also spotted our first incredible looking Blue-faced Honeyeater around the trees near to the petrol pumps along with a pair of inquisitive Torresian Crows. A familiar sight around Jabiru and other populated areas. Before heading over to our camp site we had a quick look around the Bowali Visitor Centre just outside the township of Jabiru. Here we picked up some literature about the area and some useful maps in order to plan our week ahead. It is a fantastic open plan structure inspired by an Aboriginal rock shelter and was well worth a visit to familiarise ourselves with the culture of the local Mirarr clan, the traditional occupiers of the area. It was also a good resource to find out more about the flora and fauna we had already seen since entering the park. 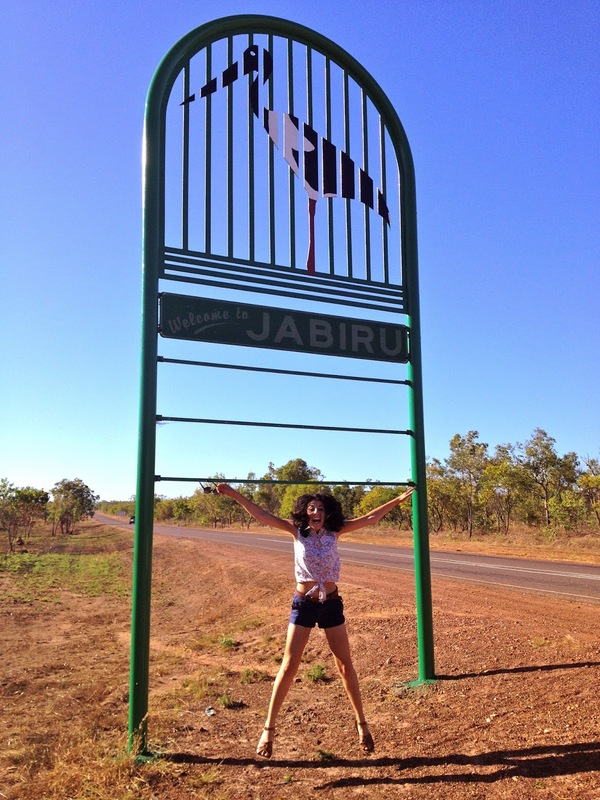 Nadia jumping for joy at reaching Jabiru! We then headed over to Lakeview Park to pick up our keys for our 'bush bungalow'. To be honest it was a thousand times more luxurious and spacious than we were expecting with its flat-screen television, kitchenette and air-conditioned rooms. Nadia felt pretty guilty thinking that her mom and dad would be roughing it under canvas over the next few days..... so guilty in fact that she headed off to the cool bedroom, slipped beneath the crisp cotton sheets of the kingsize bed and went straight to sleep! As the heat of the day subsided we made our way around to Jabiru Lake to see what we could find. Almost immediately we picked up one of the main targets of the trip, the ridiculous looking Comb-crested Jacana. Up to six birds were seen trotting around the lakeside vegetation with their over-sized feet as if they were walking on water. Other birds included White-bellied Sea Eagle, Black Kites by the dozen, a pair of Red-tailed Black Cockatoo and a small flock of Crimson Finch. New species included Willie Wagtail (cool bird, embarrassing name), Rufous-throated Honeyeater and a pair of Golden-headed Cisticola. Jabiru Lake, Kakadu National Park, NT. 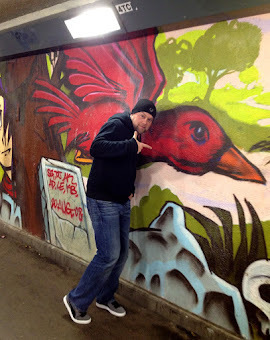 Believe it or not though it was not the birds that got my blood pumping this particular evening, it was the mammals. As the sun dropped, thousands upon thousands of Black Flying Foxes awoke from their roost and filled the air. It was not only the sight of these amazing creatures that took my breath away but also the eerie sounds and the sweet, marijuana like smell that accompanied it. I felt like Bob Marley, stoned on the set of a 1970 Hammer Horror movie. I was hoping to 'jam in' on some more fantastic Australian wildlife in the morning...... get it? Location: Jabiru, Kakadu National Park, NT.